TORONTO, 2015-4-14 — /Travel PR News/ — Bombardier Commercial Aircraft announced today that Air Côte d’Ivoire, the national airline of the Republic of Côte d’Ivoire has converted options on two Q400 NextGenairliners to a firm order. 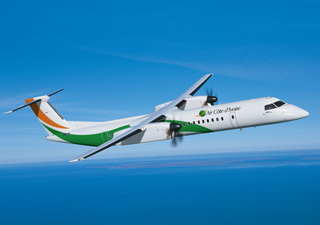 Air Côte d’Ivoire’s two options were acquired under a contract announced on December 18, 2013 that also included a firm order for two Q400 NextGen aircraft. Air Côte d’Ivoire took delivery of its first two aircraft in 2014, in a dual-class configuration. Based on the list price for the Q400 NextGen turboprop, the firm order is valued at approximately$69 million US. Air Côte d’Ivoire started operations in November 2012 and serves 22 destinations in West and Central Africa, including three new destinations in Côte d’Ivoire that were added in November 2014 . The airline transported 400,000 passengers in 2014 and its objective is to carry 600,000 in 2015. The airline is owned in part by the Government of Côte d’Ivoire (65 per cent), Air France (20 per cent) and private investor Goldenrod Investissement (15 per cent). News and information are available on www.aircotedivoire.com. Images of Q400 NextGen aircraft in Air Côte d’Ivoire’s livery are posted with this press release at www.bombardier.com. Follow @Bombardier_Aero on Twitter to receive the latest news and updates from Bombardier Commercial Aircraft. Bombardier, NextGen, Q400 and The Evolution of Mobility are trademarks of Bombardier Inc. or its subsidiaries. This entry was posted in Airlines, Business, Flights, Transportation, Travel, Travel Services, Travelers and tagged Air Côte d’Ivoire, Bombardier Commercial Aircraft, John Kassis, Q400 NextGen airliners, René Décurey. Bookmark the permalink.